Picture a Day - The Holy Land Revealed: Why Was this Photo Sold at an Auction for more than $120,000? Why Was this Photo Sold at an Auction for more than $120,000? Why was this picture so valuable? 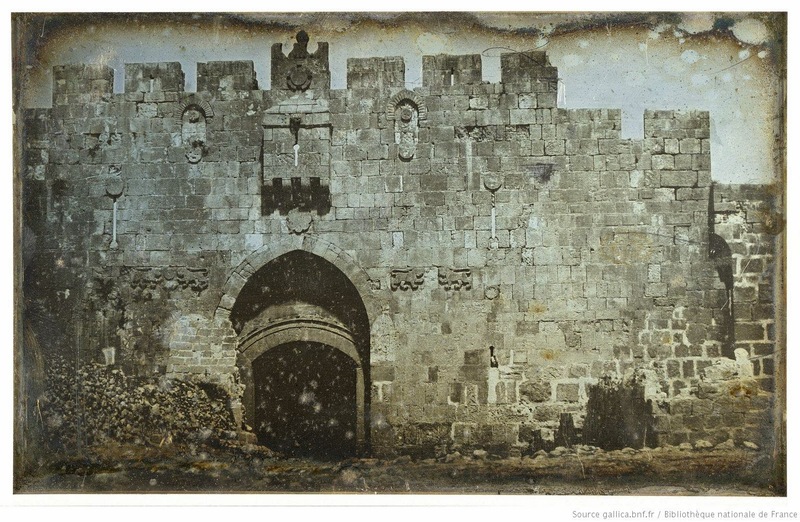 Because it was one of the first photographs ever taken in Jerusalem -- 170 years ago. 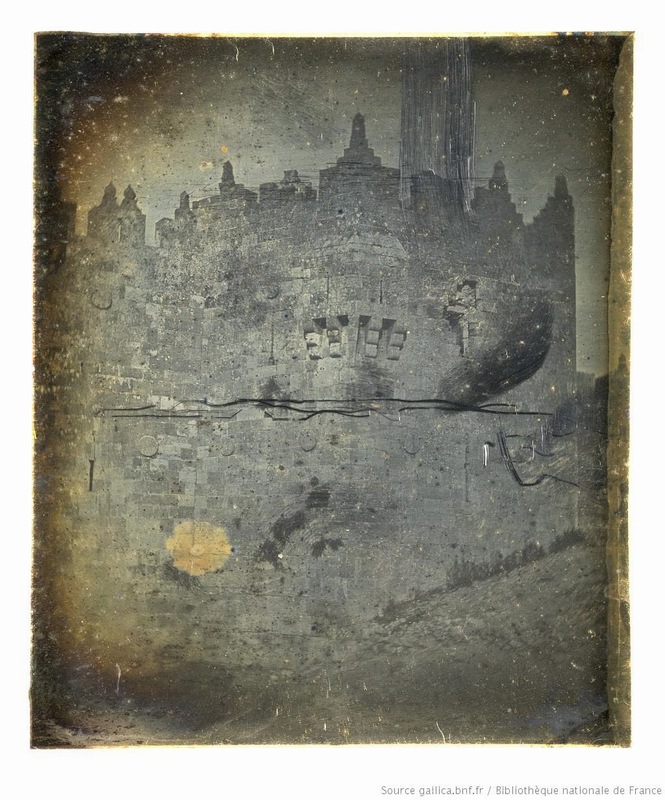 The photograph was taken in 1844 by a French photographer, Joseph-Philibert Girault de Prangey (1804 - 1898), believed to be a student of Louis Daguerre who is credited with inventing photography in 1839. The daguerreotype photos were found in a storeroom in Girault de Prangey's estate in the 1920s, but only in recent years, when libraries digitized them, did the photographs become well known. Girault de Prangey was a student of architecture and art who traveled in the Middle East between 1841 and 1844 and produced some 900 daguerreotypes. the vintage photographs in their archives. The Smithsonian Magazine published a feature on the photos this month, based on pictures published by Retronaut - "The photographic time machine." HT to Holylandphotos for pointing out the picture in the French National Library is reversed, with the al Aqsa Mosque appearing to the right of the Dome of the Rock. We flipped the photograph. This photo is labeled "Damascus Gate." We found more than 200 photographs by Gerault de Prangey in the French National Library and on the websites of leading auction houses. The pictures included scenes from Jerusalem, Damascus, Cairo, and Lebanon. We present here pictures of Jerusalem from the Library's collection and from Christie's. According to the French Library, the pictures are in the public domain. Click on pictures to enlarge. Click on the caption to view the original picture. My long pilgrimage is coming to a close... after spending 55 days in the holy city [of Jerusalem] and its environs...I am sure you can share my natural delight in fulfilling a dream cherished since childhood.... And as I speak now of these places, how happy I am to realise that in a few months I will be able to share them with you as they are, as I bear with me their precious and unquestionably faithful trace that cannot be diminished by time or distance. For this we must thank most sincerely our compatriot Daguerre, destined to be known forever for his wondrous discovery. Your photos and commentary are so helpful. But, FWIW, the panoramic of the Temple Mount/Haram esh-Sharif from the Mount of Olives is reversed. The first photo, Jerusalem from the southeast, appears to be reversed. I believe it is Jerusalem from the Northeast. When I flipped the photo horizontally, the familiar landmarks of Jerusalem were in their familiar places once again. Once you locate the Dome of the Rock on the picture, you'll realize that the picture is presented correctly. The path up from Silwan splits at the corner of the city wall and the left fork heads to the Dung Gate and Zion Gate. Gordon Govier is correct. The roads in question actually lead north and northeast out of Jerusalem (when the photo is reversed). To Anonymous, the el-Aqsa is in an impossible position for the photo to be taken from the southeast looking northwest. Also, the picture of the Kidron Valley and the monuments is reversed! PLEAZE flip the second image!